Streaming services have skyrocketed demand for broadband in NZ, with the latest Chorus figures revealing a 35% data hike year-on-year. Last month the average New Zealand home used about 234GB of broadband data, or the equivalent of streaming nearly 80 hours of Netflix, compared with 172GB in November 2017. “Most homes across the country now have several connected devices going at any one time,” says Chorus Network Strategy Manager Kurt Rodgers. “With voice activated smart devices such as Google Home and Amazon’s Alexa now becoming commonplace, we’re using far more data and requiring faster, more dependable broadband speeds. “People’s viewing habits have shifted online and it’s no longer just down to Netflix. TVNZ now have online-only OnDemand content while Freeview has just launched an industry-first device that brings free-to-air content onto a streaming platform. The Dish TV Smart VU X was one of two Freeview streaming innovations released last week — the second was the first multi-tuner PVR in New Zealand to be powered by Android TV. It integrates the full suite of Freeview features with easy access to extra content and apps on Google Play. And this month Sky released a new Nickelodeon app, Nick Jr Play, and added Download to Go for Sky Go for offline viewing (albeit in SD “at a resolution optimised for viewing on devices”). The rapid growth of broadband data use in New Zealand shows no sign of slowing, with latest figures showing a massive increase in demand. Figures just released by Chorus continue to show that fast, reliable broadband is an essential part of many Kiwis’ day-to-day lives. Nationally, the average New Zealand home used about 234GB of broadband data in November this year compared with 172GB last year, showing more than a 35 percent increase. 234GB is the equivalent of watching nearly 80 hours of content on Netflix each month. Porirua consumed the most internet data at an average of 274GB per household, while Waitomo saw a data increase of over 60 percent per household in the last 12 months. “Most homes across the country now have several connected devices going at any one time. With voice activated smart devices such as Google Home and Amazon’s Alexa now becoming commonplace, we’re using far more data and requiring faster, more dependable broadband speeds,” says Chorus Network Strategy Manager Kurt Rodgers. “People’s viewing habits have shifted online and it’s no longer just down to Netflix. TVNZ now have online only, OnDemand content, while Freeview has just launched an industry-first device that brings free-to-air content onto a streaming platform. 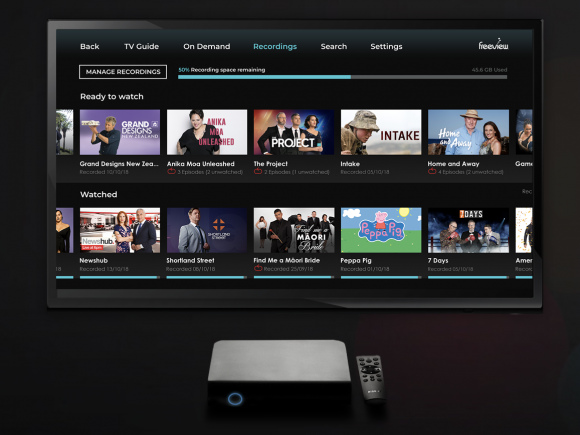 “Freeview’s new streaming device integrates the offline and online worlds into one user interface. It’s a simple, small and tidy device that attaches magnetically to the back of your TV and removes the need for ugly aerials, coax cables and satellite dishes. “And of course the gaming industry has recently boomed. In July we experienced the biggest ever data spike on the Chorus network due to New Zealanders downloading the latest version of Fortnite,” says Mr Rodgers. New Zealand has already seen dramatic improvements in broadband thanks to the Ultra-Fast Broadband (UFB) fibre rollout and the Rural Broadband Initiative. Improvements have also been seen with updates to the broadband electronics across Chorus’ copper network. Mr Rodgers says Chorus has made it easier for people to work with their broadband provider to upgrade to VDSL. To find out what broadband speed your household could be getting and how to upgrade, visit www.chorus.co.nz and enter your address into the broadband checker. I’d stream Sky in HD … if only they’d let me.